Santa Clara Valley Brewing (SCVB) calls their latest release, a Double IPA, "Valley Surprise". The only surprise would be if it sucked. SCVB Brewmaster Steve Donohue has long demonstrated his considerable skills with hops well back to his days with Firehouse Brewing. Valley Surprise is the latest in his long list of these examples and a very worthy follow-up to SCVB's highly successful Electric Tower IPA. Valley Surprise has plenty of strong, punchy tropical hops flavors with a slight resiny finish. Even better, it's a very dry Double IPA with virtually no sweetness letting all those great hop flavors come through. It's a welcome departure from a lot of sweeter tasting West Coast Double IPA's, some of which border on tasting like sickening hop syrup. I picked up at bottle at San Jose's Royal Liquors and also had some at my neighborhood hang-out Campbell's Little Lou's BBQ. You can find it a plenty of other locations and my guess is you'll be seeing it around at SF Beer Week. The passing of Ernie Banks brings back lots of great memories of the man. We all share the iconic image of the eternal optimist baseball ambassador, full of illogical cheer while toiling away through a bunch dreadful Cub seasons. I once met him in person and saw a side different of him few realized was there. It was in a 10 kilometer race held in suburban Chicago after my freshman cross-country season in 1981. A gun control group organized the "Run Against the Handgun" in the town of Morton Grove. With little advance notice, it was announced Ernie Banks would appear and run the race. At the time, I didn't think much of it. But today, I realize the tremendous disconnect between the cheerful, popular apolitical sports personality lending his name and support behind a controversial, polarizing issue. Taking stands on political and social issues was not something Ernie Banks was known for. 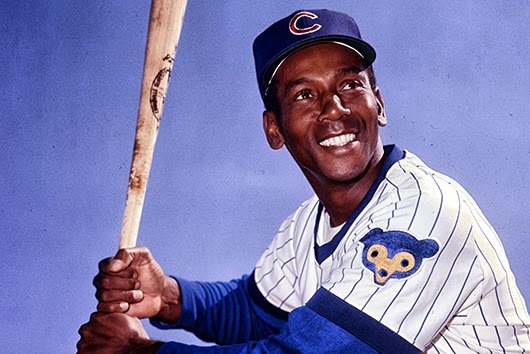 However, he ran unsuccessfully for Chicago alderman in 1962 and after retiring from baseball, formed the "Ernie Banks - Live Long and Beyond Foundation" to benefit disadvantaged youth and elderly, described as focusing on social welfare, and well as eliminating prejudice and discrimination among ages, groups, and races. One of the things African Americans of his generation instinctively learned growing up was being outwardly cheerful while keeping quiet on difficult subjects like race and politics. This was often a wise path in an era when people of his race got into real trouble whenever they become too outspoken. My Dad and I were both fans of the Cubs and supported gun control, so we eagerly arrived in the small park that late October morning with about 200 other runners. It took a while to find Ernie Banks. The was no press and little clamor about his presence. He wore plain cotton track suit, looking pretty much like any other middle aged guy about to go on a run that cool, clear morning. My dad and I lined up behind him, and with a bang of a gong (no starting pistol!) we were off. Ernie Banks, clearly a much better baseball player than runner, broke into a slow shuffle. I quickly maneuvered around him and my dad put his hand on his back, I think he wanted to touch him, before passing him as well. With that, we left Ernie Banks behind. For the first half of the race, my dad and I ran together. I remember it being a pretty challenging pace but at the turn-around, I decided to push even harder, pulling away from my father. I started passing large packs of runners at first, then a few individuals as the runners continued to spread out. At around 4 1/2 miles, I passed one runner breathing really loud. All I could hear from this guy as I passed him was a loud "HUUUHH-SSSHHHHHH, HUUUHH-SSSHHH" filing my ears. By that point, I was pretty exhausted but there was no way I was going to let the heavy breathing monster catch me. Driven by an irrational fear, I pushed with everything I had along the twisted path lined with barren trees over the last mile trying to get away from the loud HUUUHH-SSSHHH's, which slowly diminished in intensity as he started falling behind. I staggered across the finish line with no energy left in a time 39:38, setting a personal record and braking the 40 minute 10k barrier for the first time in my life. I could barely stand up when my dad came across the finish a couple minutes later. After he recovered, Dad spotted a McDonald's across the street and cheerfully said "I'll race you to McDonald's for breakfast," taking off running across a field. I literally could not lift my feet to chase him. As for Ernie Banks, he was gone, apparently never finishing the race, disappearing just as quietly as he arrived. Say what you will about Anheuser-Busch, some of the finest brewers in the world work there. While an Anheuser-Busch product is something I rarely reach for, I do enjoy drinking an ice cold Bud maybe twice a year. Furthermore, I have tremendous respect for the beer itself. You can learn a lot about a beer by going to its source, so I've long wanted to trek up to their brewery Fairfield, CA to take the Anheuser-Busch Brewmaster Tour on a chilly late December Saturday afternoon, finally getting the chance to look inside the imposing building in I've seen several times driving through Fairfield on Interstate 80. I honestly didn't know what to expect when signed up for the Brewmaster tour, which at $25 promised a more in-depth experience than the standard complimentary brewery tour. Was I paying twenty-five bucks for just a sales pitch with some extra swag thrown in? Or would I get to stand next to the Brewmaster, hearing all his deep words of wisdom for creating a clear, iconic lager as he pitched the yeast for the next batch of Budweiser? As you might guess, the tour turned out to be somewhere between the two. One of the first thing our guide showed us was a couple big windmills outside the brewery. One was installed in 2011, the second one last August. Together, they supply about 40% of the brewery's total electrical power. Our guide also explained that in the last four years, the brewery has reduced its water usage by 40%. Most craft breweries are pretty forward thinking when it comes to the environment, but how many can claim things like that? As for the brewery itself, having visited plenty of other smaller breweries, the immense size and scale of the place was the first thing that struck me. Of course, I expected it to be bigger than all the craft breweries I've visited but somehow walking down the long hallways lined with huge tanks directly confronted me with the tremendous scale Anheuser-Busch brews at. A considerable amount of engineering is required just for all the plumbing and mechanical support of all the huge equipment. Say want you want about Anheuser-Busch products, they are clear results of impressive ingenuity and know-how. its water used by 40% in the last four years. Our guide was personable and well trained, recounting all the basic steps of the brewing process. She even talked about IPAs and other beers Anheuser-Busch didn't brew, seemingly admitting that the beers brewed inside the factory walls were mired a slow, tedious and most likely irreversible decline . Since the Fairfield facility brews Anheuser-Busch beer destined for Northern California and the Pacific Northwest, this brewery, out of the twelve Anheuser-Busch operates nationwide, has been hit especially hard by the craft beer revolution. Perhaps the fact that Anheuser-Busch falls on the trailing edge of America's beer tastes was most evident when our guide took us into the hop storage room. Standing in the hop room at any brewery and inhaling all the pungent aromas is easily of the most stimulating experiences know to humankind. On that score, the Anheuser-Busch hop room was a bit of a let down. Like their beer, their hop room just really wasn't that hoppy. The hop aromas were noticeable but lacked the powerful, almost intoxicating presence in a hop room at any craft brewery I've been to. We did get the opportunity to taste four beers straight from the fermentation tanks. Bud Light was crisp and clear with the light green apple flavors of classic Budweiser. Natural Ice had a slight, unexpected sourness. Busch Light tasted like absolutely nothing. Shocktop Wheat compared to those three was positively a flavor explosion and underlined what a radical departure Shocktop must have been from the standard Anheuser-Busch line when it was first released. Sampling the beer straight from the tank. The tour over, my wife and I used our complimentary drink tickets to try a couple Anheuser-Busch beers in the tour tap room. I was actually quite impressed with Shock Top's Shockolate with plenty of rich chocolate flavors. The combination of yeast and chocolate worked well together, but it was a bit too sweet. Less sweet and it would've been a really interesting Wheat Beer. A little more sweetness and it would've been a disgusting alcopop, although some might argue it was already there. As for the tour itself, let's say I was pleasantly surprised. I thought it was well worth the twenty five bucks, even without the complimentary baseball cap and tasting glass. The free tour doesn't go to hop room or fermentation tanks, and much of the tour is pre-recorded so I say spend a few bucks and take the Brewmaster tour. While I didn't learn any profound truths about how the Anheuser-Busch beers are brewed, I certainly got an inside look at major American brewery and a much better appreciation of what goes on inside. I also saw that Anheuser-Busch has a genuine interest in becoming a more environmentally sustainable corporation, a side of the company I didn't expect and few actually see. With that, I'll leave you with a few more pictures from that afternoon. Alan McLeod's rescue of this month's Session was more timely in more ways than one. The day he posted the Session topic when the original host went inexplicably missing, I purchased the book Wine Wars online. Wine Wars is written by economist Mike Veseth and describes the economic forces between globalization and localization that are changing the wine industry landscape. Sounds like what's going on in beer, don't you think? Now only in my weakest moments do I turn to a glass of wine so why would I want to read a book on wine economics? Well, I can't find any books on beer economics. So when Alan asks for the Session topic "What beer book which has yet to be written would you like to see published? ", my answer is a book on beer economics, written by an actual economist. Sure, economics has long been an interest of mine, but this book would certainly be in demand. Plenty of us are asking questions like "Will there be a craft beer bubble?" , "How do they make me buy the beer?" and even "Will there be massive consolidation in the craft beer industry?" There's concern about potential over pricing of craft beers, questions on whether pricing pressures will start squeezing smaller craft breweries and plenty of speculation on the significance of events like Anheuser-Busch acquiring 10 Barrel Brewing. A good economist would shed a lot of light on these questions. I used to enjoy reading Patrick Emerson's Beeronomics blog which provided lots of good economic insights on beer but unfortunately his blog has gone silent since last May. Who would write this book? I honestly don't know. It's clear that compared to wine, beer is clearly behind when it comes to economists. There's enough wine economists in the United States to form the American Association of Wine Economists . They even have their own research journal and host an annual conference. Not surprisingly, Europe has it's own European Association for Wine Economists. I could not find any similar organizations relating to beer other than the bi-annual Beeronomics Conference, organized mostly by European academics although for the first time in its short five year history will take place in the United States this coming fall. We've got plenty of books full of beer reviews and pairings of beer with food is pretty well worn territory. Personally, I'd like to see a good book on the unique economics of beer. I doubt I'm alone.